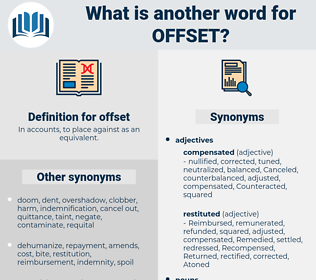 What is another word for offset? In accounts, to place against as an equivalent. reparations, displacements, allowances, deductions, discrepancies, differentials, expenses, moves, differences, Movements, clearings, scrolls, payments, Rewards, inferences, glaciers, flows, lags, gaps, amounts. Reimbursed, Erased, trimmed, covered, replaced. softened, stopped, mitigated, Ameliorated, shortened, frustrated, Accommodated, alleviated, minimized, diminished, destroyed, Counteracted, postponed, outweighed, discontinued, differentiated, netted, interpreted, Eliminated, corrected, attenuated, restricted, neutralised, lessened, calculated, isolated, amortized, incorporated, extinguished, maximised, rectified, bestowed, recovered, removed, Jeopardized, moved, negated, Reimbursed, Overtaken, Depreciated, staffed, reversed, reconsidered, lowered, absorbed, countered, allocated, adjusted, satisfied, invalidated, forfeited, overturned, addressed, moderated, Averted, lost, subtracted, amortised, obstructed, marginalized, positioned, Followed, Curtailed, affected, Ceased, reconciled, deducted, financed, Deleted, Abrogated, cushioned, enclosed, Discounted, engrossed, Supplemented, eased, terminated, credited, Excluded, marginalised, undermined, balanced, deactivated, Met, eroded, opposed, Superseded, smoothed, Erased, Repaid, Liquidated, consumed, derived, Shifted, Slowed, Overridden, Dampened, effected, confined, Told, Disallowed, activated, Forgiven, nullified, Abated, Incurred, processed, concealed, relieved, tailored, Vacated, diverted, posted, Overruled, Spared, impaired, ignored, disposed, owed, Obscured, cancelled, Canceled, executed, struck, delayed, mirrored, covered, weakened, Disclaimed, subdued, Captured, Debited, disabled, Receded, seized, Avoided, used, Inferred, Earmarked, Aborted, withdrawn, dismissed, Declined, Hampered, sponsored, thwarted, Subsided, buffered, Performed, accompanied, lifted, ingested, Deployed, advanced, Abolished, treated, Compromised, adsorbed, faded, realigned, Remitted, fulfilled, assigned, narrowed, Rescinded, Exceeded, Rewarded, surrendered, qualified, swept, diluted, Returned, intended, discharged, ended, completed, Deduced, mediated, defined, Served, conceived, replaced, concluded, varied, expended, Allayed, Revoked, Annexed, undone, Appended, designed, tempered, hired, filled, charged, inclined, Accounted, weighted, attached, Wiped, paid, broken, Gleaned, discarded, hidden, Undertaken, Devised, coupled, Waived, fallen, relaxed, lapsed, closed, vanished, contacted, Expunged, dropped, Weighed, Repealed, Quashed, Lagged, crossed, breached, Borne, matched, Annulled, joined, taken, missed, eaten, gone, Flown, turned, funded, Demanded, blunted, washed, Arrived, Grounded, masked, Purged, conducted, drawn, Brought, worn, Damped, given, Awarded, laid, placed, Claimed, Carried, done, kept, made, overcome, compensated, Remedied. neutralise, Mitigating, outweigh, reimburse, cover, amortize, absorb, attenuate, negate, recoup, defray, soften, incapacitate, nullify, cushion, deduct, eliminate, Eliminating, overcome, repay, lessen, ameliorate, correct, ease, recover, depreciate, relieve, accommodate, subsidize, displace, frustrate, rectify, diminish, circumvent, assuage, cope, tackle, deter, thwart. extension, continuance, prolongation, persistence, continuation. It quite offset the slight touch of obstinacy in her chin - but, in truth, did the latter require an offset? The charm lent by their logical completeness causes us to prefer them to others where the perfection of drawing and style in the individual window is partly offset by lack of harmony with others near it.